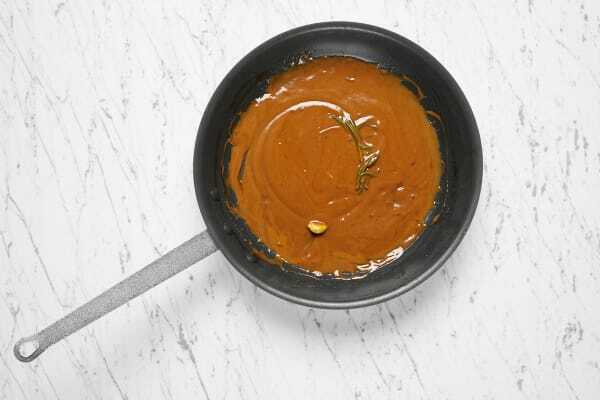 Demi-glaze is an intensely rich, glossy sauce reduction. A master sauce of French cuisine, traditional demi-glace requires simmering beef stock for hours. But don’t panic---we’ve made it for you! 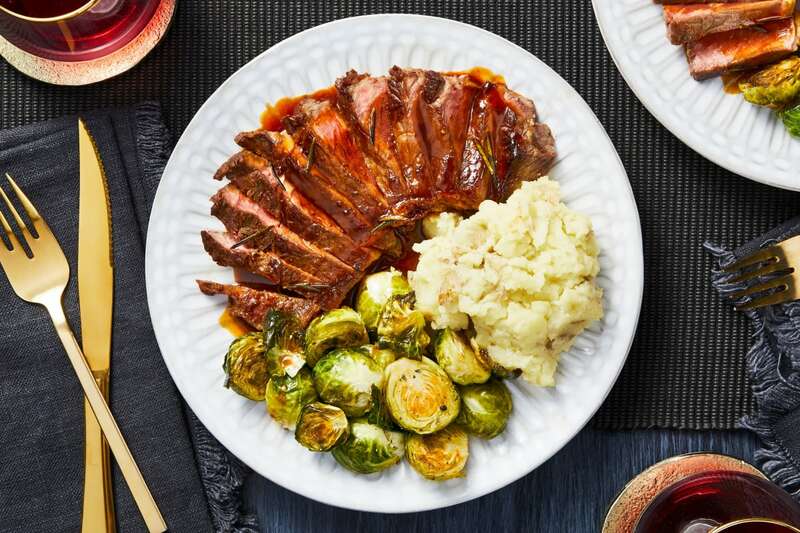 When our own rich, glossy demi is used in the pan sauce for this luxurious dish, it creates a savory depth of flavor that’ll make anyone you feed believe you slaved at the stove for hours. Don’t worry, though--we’ll never tell. Adjust rack to top position, then preheat oven to 425 degrees. Wash and dry all produce. Trim, then halve Brussels sprouts. Mince or grate 1 clove garlic (2 cloves for 4 servings). Zest, then halve lemon. 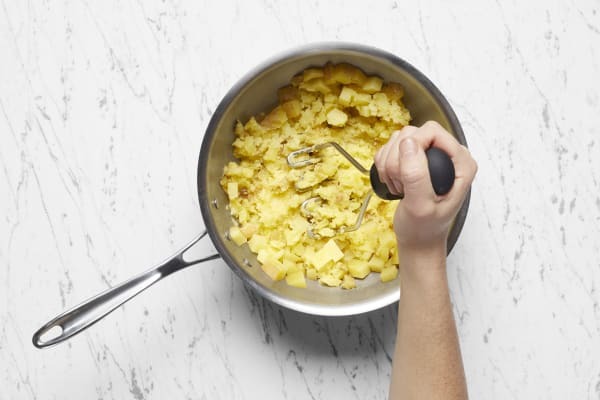 Dice potatoes into ½-inch pieces (no need to peel). Place in a large pot with salted water to cover. Boil until tender, about 15 minutes. Drain potatoes. Melt 2 TBSP butter in same pot over low heat. Add minced garlic; cook until fragrant, about 30 seconds. Return potatoes to pot; mash with a potato masher until smooth. Stir in sour cream; season with salt and pepper. Keep covered until ready to serve. Meanwhile, toss Brussels sprouts in a large bowl with a large drizzle of olive oil and a pinch of salt and pepper. 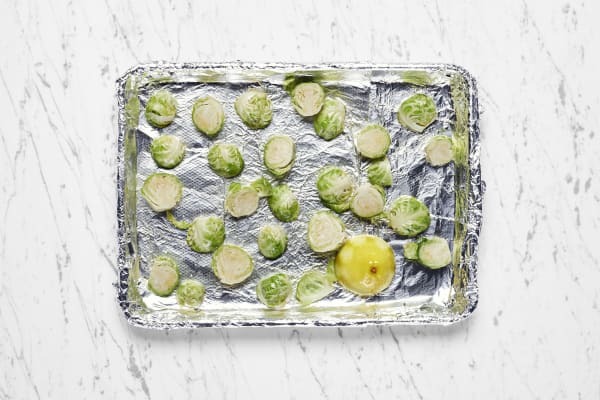 Place Brussels sprouts and 1 lemon half on a baking sheet. (Use the rest of the lemon as you like.) Roast on top rack until golden brown, 20-25 minutes. Pat steak dry with paper towels; season generously with salt and pepper. Heat a large drizzle of oil in a large pan over medium-high heat. Add steak and cook to desired doneness, 3-6 minutes per side. Turn off heat; remove steak from pan and let rest. Wipe out pan. Melt 2 TBSP butter in same pan over medium heat. Add remaining garlic and 1 sprig rosemary (2 for 4 servings) and cook, stirring, until fragrant, 1 minute. Reduce heat to low. Add demi-glace, mustard, and ¼ cup water (1/3 cup for 4 servings). Cook until thickened, 1-2 minutes. Stir in any resting juices from steak. Turn off heat; season with salt and pepper. Remove and discard garlic and rosemary. Slice rested steak against the grain. 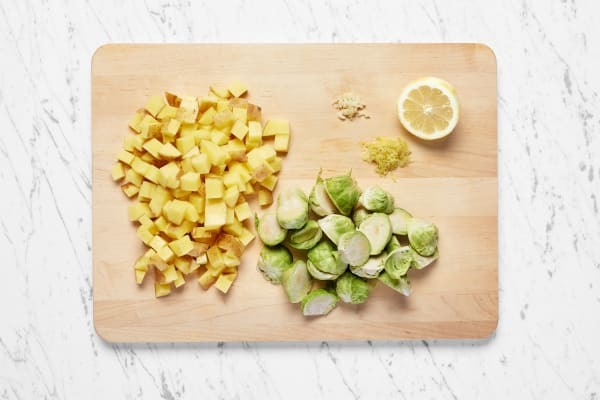 Squeeze as much juice from roasted lemon as you like over Brussels sprouts. Sprinkle with lemon zest and chili flakes (to taste). 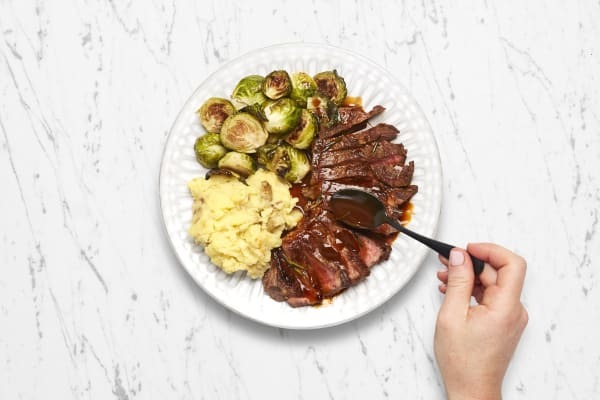 Divide steak, Brussels sprouts and mashed potatoes between plates. Spoon sauce over steak and serve.